Again, this is pretty straightforward area, and offers a similar variety of moves as described for Plaistow. 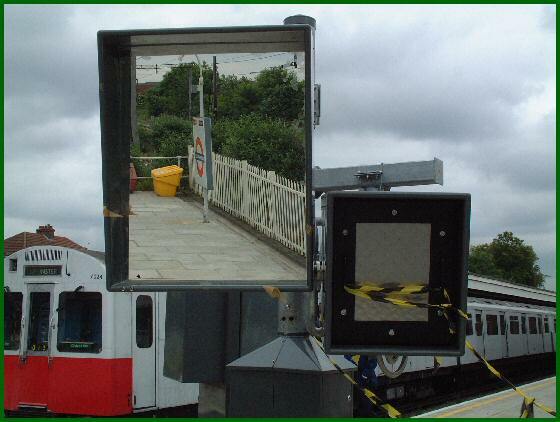 From a Train Operators point of view there are a few signalling differences, but the end results are the same. However whereas the Hammersmith & City Line use Plaistow quite routinely the District has no 'booked' moves at that location. There are a number of District Line trains timetabled to use Dagenham East however (the Hammersmith & City doesn't venture past Barking) and it is frequently used to recover late running in the service. One thing that does differ though is that there is a siding to the west of the station, accessed by a move from the Bay Road platform. This siding can be seen here; it is located straight ahead of the Bay Road - to the right of the picture. This is looking from the westbound platform, looking west. To the right of the picture is the eastbound platform with a train approaching; beyond that is the Bay Road. The overhead catenary power lines are for the C2C line which runs next to us for the whole length of our line between Upminster and Campbell Road, which is between Bow Road and Bromley-by-Bow. 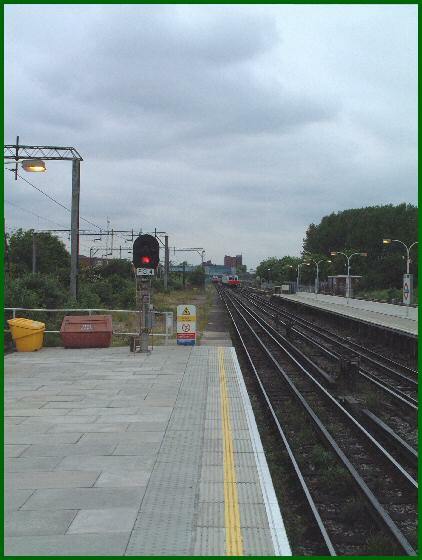 Looking across to the eastbound platform from the same location the Mirror and monitors are visible for a train reversing from the eastbound platform to travel westbound; the 'wrong road' station starter can also be seen just ahead of the last station name board. 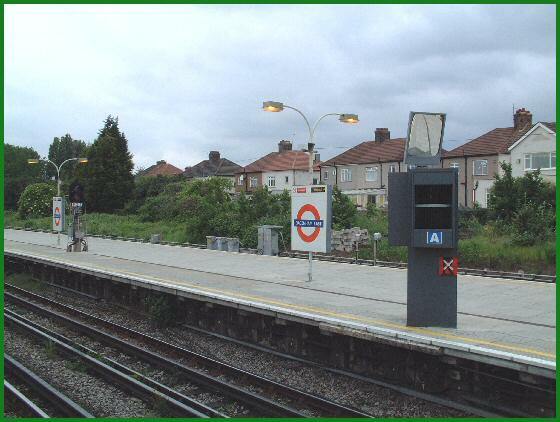 When taken on the 25 May 2004 the station (in common with a number of others) was in the process of having new monitors installed. At the moment they are not in use and are currently facing the wrong direction so as to prevent any confusion! the 'old' equipment is visible between the new kit and the eastbound train.